On January 26, 1994, the North Carolina Highway Patrol was awarded project funding from the Bicycle and Pedestrian Transportation Office of the Department of Transportation to create a statewide Bicycle Safety Program. Through research, the Highway Patrol recognized the need for such a program. 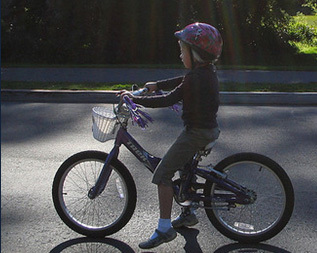 The injury and death rate statistics of juveniles while operating bicycles on the streets and highways of North Carolina without proper bicycle safety training and proper safety equipment were alarming. In an attempt to decrease these alarming statistics, the Highway Patrol initiated its Bicycle Safety Program on April 15, 1994, with the first Bicycle Rodeo being presented in Bertie County to the students of Askewville Elementary School in Askewville, North Carolina. The Patrol has since traveled extensively across the state presenting the safety program, safe bicycling tips, skills training, and awarding bicycle helmets, of which 40% were donated by safety conscious North Carolina businesses. The Highway Patrol Traffic Safety Information Staff (TSI) has noted an exceptional community response marked by voluntary participation from adults across the state in the presentation of this program. The mission of the Highway Patrol through this effective and well-received initiative is to provide bicycle safety training to children between the ages of four and 14 years of age who reside predominately in the rural areas of North Carolina and have no access to this form of vital information.